TC Motors provide vehicle owners throughout the Lincoln area with first rate vehicle servicing, repairs and MOTs, all at highly competitive rates. As part of this service, our skilled mechanics are able to carry out thorough and effective car diagnostics and fault analysis on every make or model. Vehicle diagnostics involves the assessment and identification of problems within a vehicle using a series of tools and techniques that range from superficial physical checks to complex computer-based analysis. They help to determine any issues car owners may be experiencing with their vehicles, allowing our team to get to work on resolving the problem and ensuring that you’re back on the road as quickly as possible. Our commitment to honest work means that all quotes contain no hidden charges or fees, so you always know what you’re paying for with us, and the skill and experience of our mechanics guarantees fast turnarounds on every job. Here at TC Motors, we’re proud to have achieved UniPart Car Care Centre status, and all of our practices are in line with Motor Industry Code, meaning you get the very best level of service possible with us. Get in touch with the team today to book your car diagnostic analysis. Engine problems can rapidly become a serious issue, so you should have it checked as soon as your engine warning light is illuminated. The warning will light up when the ignition starts, but if it remains lit or flashes whilst driving, it could mean there is a fault with the entire management system. Similarly to the engine warning light, the oil warning light will illuminate when the ignition is turned on, but should go out once the engine starts. If it doesn’t, and remains lit or flashes whilst driving, it could indicate a low engine oil level. Check your oil using the dipstick. If it is correct, the problem will require professional help to resolve. Your brake fluid levels could be low if the brake light remains illuminated after the handbrake has been released. Top up your levels before driving any further. If your ABS warning light comes on whilst driving, it could indicate a number of different faults, and will require immediate attention. As with every warning light, the battery light will come on briefly when the ignition is turned, but should turn off once the engine has started. If it doesn’t, or it comes back on whilst driving, your battery may be loose or you may have a faulty alternator belt. The problem will require professional assistance to resolve. Diesel Injector Problems? Call us for expert repairs. 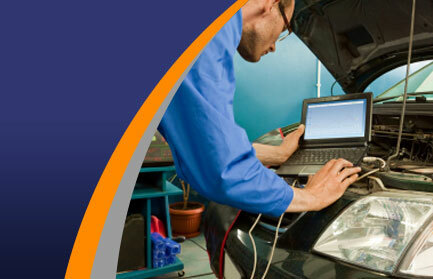 Qualified mechanics to help with all your engine and management system problems.